My first impression of Yahoo’s new Livestand reading app is that it looks beautiful. My second is that, despite rumors that it was going to be a lot like Flipboard, it isn’t designed much like Flipboard at all. And no, that isn’t a good thing. But with Livestand, Yahoo seems to have taken exactly the wrong approach. It’s not about your technology, your design, your publishers or your advertisers. First and fundamentally, it’s about readers. Those other four pieces are important. In a different media climate, they would be what you’d start with. But not today. Flipboard gets this. The lesson other media companies seem to have learned from Flipboard is to try to build slick-looking apps that aggregate content from multiple sources. But those are actually the least innovative things about Flipboard. Flipboard begins as a visualization of your Twitter and RSS feeds. It’s an active process, not one in which you “lose yourself,” as Yahoo’s ad copy suggests. You choose which sources you want to port to Flipboard, and it re-presents them in a highly readable format. It’s a personalized magazine for an active, social, highly engaged reader. Then, because the app has attracted this engaged readership, magazine companies like Condé Nast (which also owns Wired.com) work to get their content in front of those readers. Yahoo’s Livestand doesn’t do this. It assumes its existing base of readers will naturally migrate over to Livestand. It aims to attract them there with Yahoo News and third-party content. You choose, not from the entire web, but initially and for the most part from this walled subsection of it. Then, the app watches you. It looks at what you interact with and how, and shows you content based on those interactions. 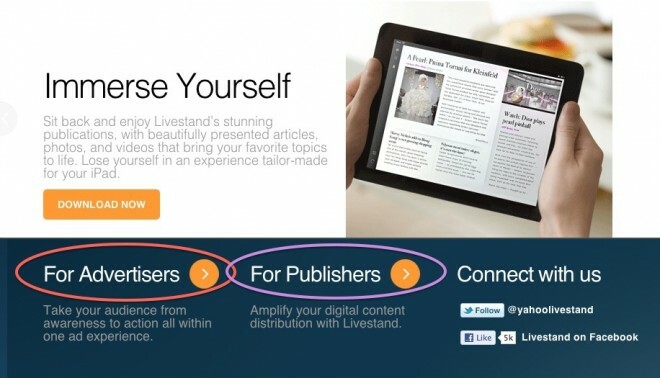 If Flipboard is “social,” Livestand is “personalized.” These two approaches are very different. Flipboard solves an actual problem for readers: trying to distill newsworthy reading items from already-existing RSS and social media feeds. Yahoo’s Livestand only solves problems for publishers and advertisers: how to display content and advertising to readers without having to have everyone write their own code from scratch. It may seem like I’m unfairly picking on Yahoo and Livestand. And I’d probably agree with you. The vast majority of companies trying to create iPad reading applications make all the same mistakes. But ever since Google Reader got positively nerfed, I have zero patience for new reading apps that don’t begin and end with what readers like, want and would choose for themselves.